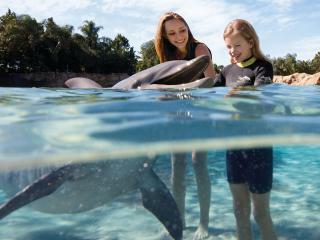 What is included in the Dolphin Swim all-inclusive price? Your Discovery Cove experience includes everything: a dolphin swim experience; unlimited access to all swim and snorkeling areas; the Free-Flight aviary; a sumptuous meal; use of a mask, snorkel, life vests and/or wetsuits; towel; locker, parking; lounge chairs and beach umbrellas. What is included in the Non-Dolphin Swim price? The Non-Dolphin Swim Package includes all the same great elements as the Dolphin Swim package with the exception of the dolphin swim itself - unlimited access to all swim and snorkeling areas; the Free-Flight aviary; a sumptuous meal; use of a mask, snorkel, life vests and/or wetsuits; towel; locker, parking; lounge chairs and beach umbrellas.